Heat the oven to 400F. In a bowl, combine filling ingredients and toss to mix. 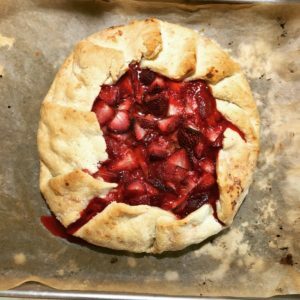 On a lightly floured piece of baking parchment, roll the pie crust out to about 14 inches in diameter. Transfer the parchment and crust to a baking sheet. Pile the filling in the center and fold the edges up over the filling, leaving about a 5-inch circle of filling showing. Sprinkle with sparkling sugar and refrigerate for 15 minutes. Bake until the crust is golden, and the filling is bubbling, about 40 minutes. Let stand for 15 minutes before cutting.